The mission of the North Atlantic Arts Alliance is to enrich our rural Maine community by supporting live music, music education, art, local agriculture, and sustainable practices. A new bass student gets his first lesson at the music festival! 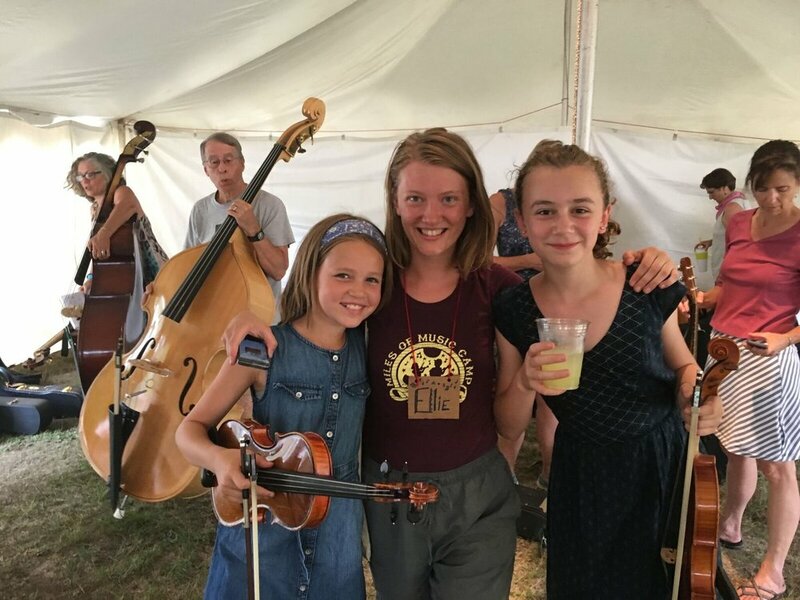 The alliance achieves its goals through programs and opportunities at its flagship events: -the ossipee valley string camp -the ossipee valley music festival. I. 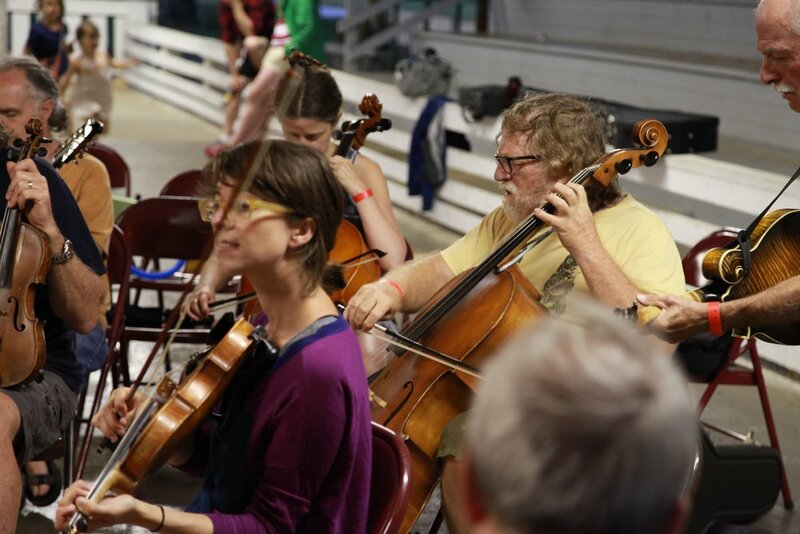 SCHOLARSHIPS: We provide scholarships each year to our five day Ossipee Valley String Camp, taught by world renowned instructors in acoustic music. special consideration is given to local students ages 10-21, and senior citizens. We aim for 10-15% of our students to be on partial to full scholarship. Recycling team during the String Camp and Music Festival hand sort trash to reduce it by 50%, all redeemables from the two events are donated to local school programs. The Ossipee Valley String Camp and Music Festival have been estimated to bring over 1 million dollars of revenue into the state of Maine, by the Maine Board of Tourism. The Ossipee Valley Music Festival is a 4-day celebration of music, food, and community, in Southern Maine. The festival is held on the Ossipee Valley Fairgrounds, in the foothills of the Saco & Ossipee River Valley. Just 45 minutes west of Portland Maine. The festival has grown over the years to become one of the premier events in New England for Roots and Americana music, and camping. The festival features 4 stages, workshops, barn dances, yoga, local food, handmade crafts, a farmer’s market, and locally brewed beer and cider. It is known as the festival for everybody--hipsters and jamband hula hoop chicks dance next to 60s hippie grandmothers, kids grow up at the festival (they get in free until they’re 17! ), and their parents get to relax--(no one has time to look at a smartphone here), everyone else fits in somehow--and everyone brings an instrument. The festival also features kids activities all day, and a free music program for kids, Roots and Sprouts. The Ossipee Valley Music Festival is known for its omnivorous appetite in music, featuring Americana, Roots, Blues, Bluegrass, Folk, Jazz, Celtic, and more and hosts national, award winning headliners from as many genres as possible. 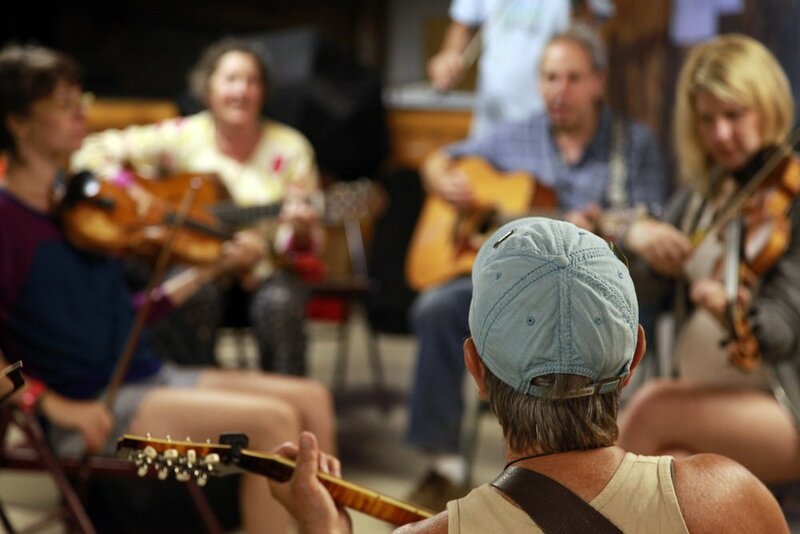 The Ossipee Valley String Camp is a five day long acoustic music fantasy camp--for all ages and levels! Students explore small group lessons and workshops in fiddle, cello, mandolin, guitar, banjo, ukulele, upright bass, and singing & songwriting, and work with camp "bands" to learn performance skills that they showcase in the final performance on the music festival Main Stage! The String Camp flows directly into the Music Festival with the final performance for camp kicking off the first night of the festival performances, and all attendees to camp receive a free ticket to the festival! The String Camp provides world quality instructors from as prestigious backgrounds as the house band of Prairie Home Companion, and the staff of Berklee College of Music, and all of the instructors are teachers and performers that are critically acclaimed. The camp also features local farm food, yoga, and free camping on our beautiful fairgrounds. The North Atlantic Arts Alliance works with private donors, and nationwide grant programs to secure a minimum of 10-15% full or partial scholarship opportunities for this incredible event, with a focus on scholarships for young musicians in rural Maine who have a dedicated interest in acoustic music, and senior citizens who have restricted access to such opportunities. *All meetings are open to the public upon request. Aside from the position of Executive Director, The North Atlantic Arts Alliance and its events, The Ossipee Valley Music Festival and Ossipee Valley String Camp, are 100% volunteer run. We depend on the passion and engagement of our peers to keep our mission alive and strong. Whether you volunteer during the festival, become a board advisor, work with us to secure grant funding, or contribute a charitable donation of your own, we appreciate and rely on your support.